Stace Harman spends a morning with Bethesda’s epic and emerges hungry for more. Words from lead artist Matt Carafano and new screens inside. The follow up to 2006’s Elder Scrolls IV: Oblivion. 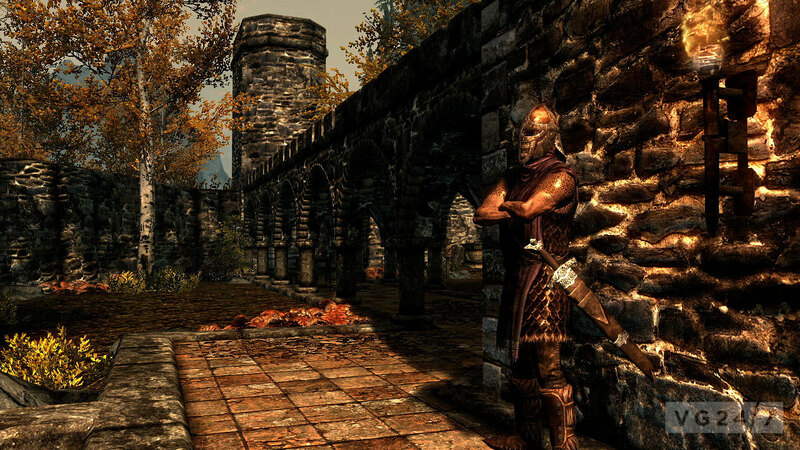 The main quest line is approximately 30 hours in length, with scores – if not over 100 – more hours of optional content. Developed and published by Bethesda. Launches November 11 – 11.11.11 – for PC, PS3 and 360. Soon, it will be time for action, not words. The launch of Skyrim is now so close you can almost taste it and it won’t be long before we can all gorge ourselves on dragon blood. For now, though, read a little more of my impressions from three hours of play time – especially if you’re not yet convinced that this is for you. 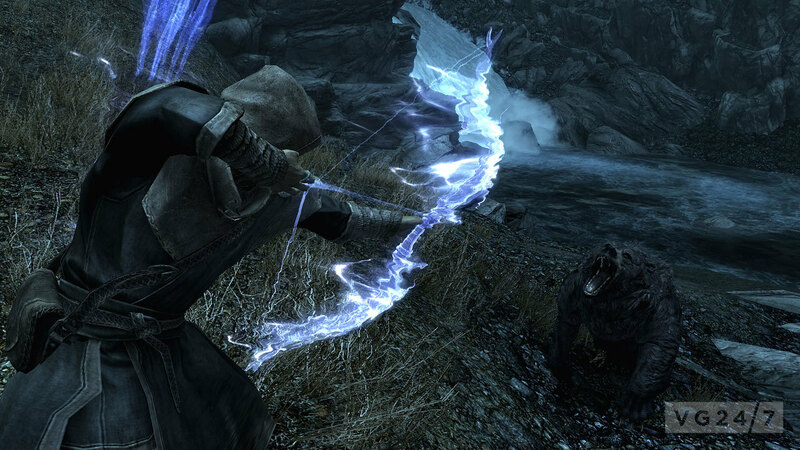 The nature of Skyrim’s three hour hands-on session perfectly encapsulates the spirit of the game. 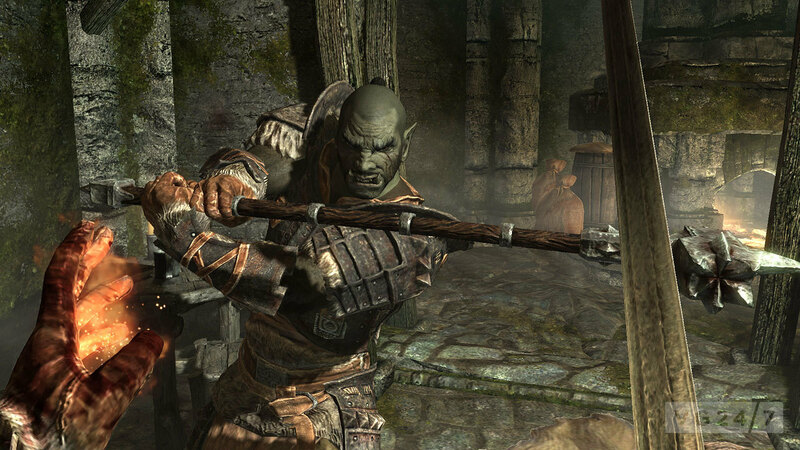 Where many preview sessions consist of meticulously chosen slices of stop-start game play that developer, publisher and PR feel will best represent their title and showcase its varying aspects, Skyrim’s hands-on is gloriously free-form. 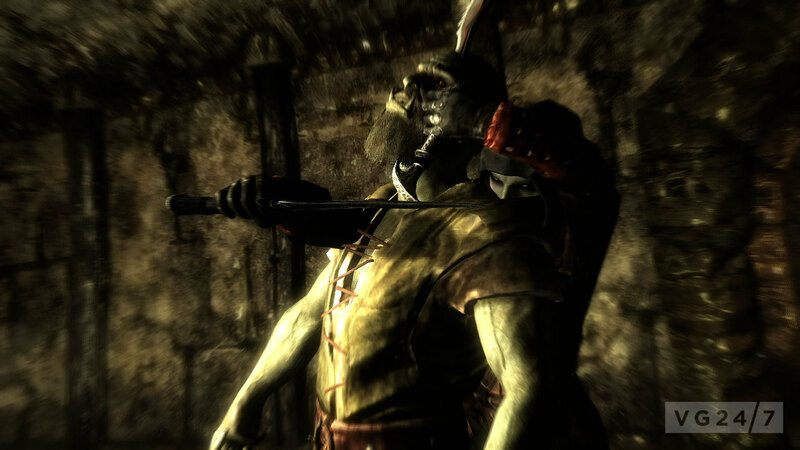 Starting a little way into the game in order to maintain the virgin territory of the opening section – and perhaps because it’s likely to be comparatively linear, unlike the rest of the game – we were cast into Skyrim’s exquisitely realised world and given free rein to run amok. The first task of character creation reveals that the process now results in more distinct avatars since we last manipulated jaw lines and skin tone in Oblivion. Each of the ten playable races have pre-defined boundaries within which you can push and pull their bone structure, meaning they still maintain key traits of their race no matter how crazy you go with the sliders. The cat-like Khajiit gets my vote for they are described as “intelligent, quick and agile” and make excellent thieves, which is just how I like to play. Fierce avatar created, I’m set free upon the land and a rolling landscape spreads out before me. A well trodden path is framed by dense forest through which cuts a snaking river. In the distance sits the resolute bulk of snow covered mountains, peaks obscured by cloud. The environment here is at once full of detail and promise, so much so that the custom waypoint marked on the map to the north-east is ignored in favour of the untamed wilderness of the river and mountains to the north-west. 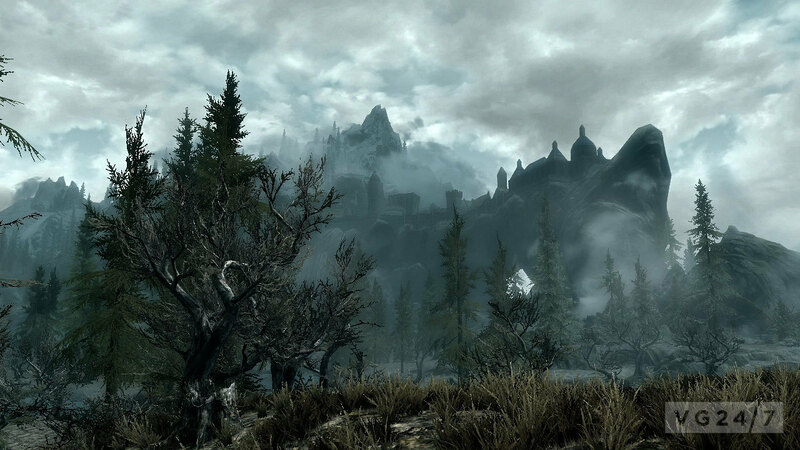 The attractiveness of the world can be attributed entirely to Skyrim’s artists, for unlike Oblivion none of the environment, not the mountains high or dungeons deep, are created procedurally – everything you see and traverse has been created that way by design. This leads not only to majestic vistas like that before me, but also to more interesting dungeons – more on that later. Heading through the undergrowth I switch to third-person to get a feel for how this more alien viewpoint fits the game. It’s a view that I return to several times over the period of the three hours, in order to see how those who like their action viewed from above and behind will be served. Happily, the sense of connection with the environment is much improved over Oblivion’s feeling of gliding steps and floaty jumps, though I still can’t imagine wanting to play the entire game this way. “We primarily view the game as a first-person experience, but we know that people do play in third-person and that it’s an important element for some players,” assures Carafano. “We’ve put a lot more work into it – we have a new animation system that makes the controls and blending a lot better in third person. I reach the foot of the mountains with relatively little incident and as I venture up its slopes the stirring music that drifted in and out during my romp through the forest gives way to a harsh squall, the aural effects cannily conveying a biting wind. Stace played a newer build than seen here. An outcropping of small stone structures provides my first look at the combat system and the quiet revelation that is dual wielding. In choosing equipment for the battle, I get a good look at the new minimalist menu, which has evidently been designed with ease of navigation in mind over aesthetic flair. Four options are presented on the cardinal compass points and split between items, map, magic and skills. Barring the skills menu, the interface appears to have been deliberately designed to be as non-intrusive as possible, with little concern for the visual flourishes of font and colouring of Oblivion or the game world integration of Fallout 3’s Pip-Boy. There’s not even a character model to look at. 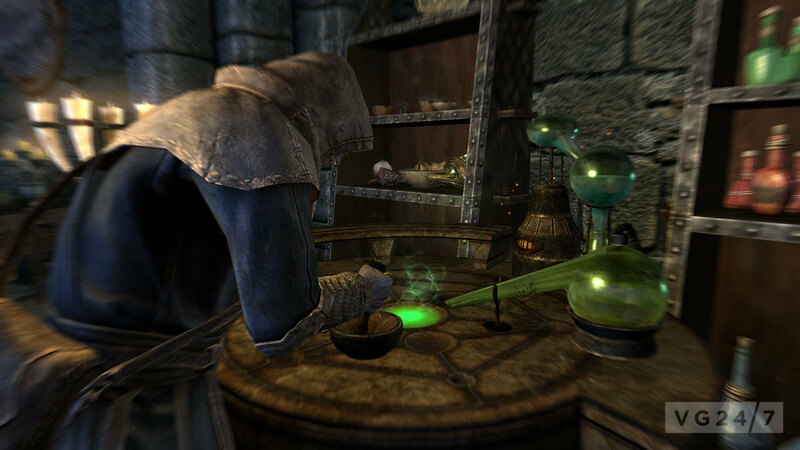 Assigning weapons, potions, spells and the like to a limitless favourites menu allows quick access via the press of a D-pad and it’s possible to assign weapon sets to two other D-pad directions. I plump for a traditional dagger and shield combo coupled with a more exotic double fire spell. Dual wielding spells increases their effectiveness at the cost of much quicker magicka drain, but this combo is enough to dispatch the low-level bandits and sufficient for me to level-up, something I do five times in total over the three hours. It’s here that I get to play with the one area of the menu that has seen artistic attention lavished upon it: if the rest of the UI has been designed with functionality and cleanliness in mind, the skills menu is where the creative juices have been allowed to floweth over. One of the joys in the way in which Bethesda approaches its RPG levelling is that you make few conscious decisions about creating the kind of character you want to play as – instead, you just play the way you want and level up accordingly. If you spend your time skulking in the shadows, picking pockets and striking your prey from behind, your stealth and pick pocket skills will increase. If you favour wading into the fray wielding a battleaxe to crack heads first and ask questions later, your heavy armour and two-handed weapon skills will increase. In this way, these component skills increase – opening up new abilities – and contribute to your overall character levelling. Each new level you gain grants a perk, which can be spent immediately or hoarded for one big splurge after several levels. Whichever way you choose to spend your perks, the ability to see each attribute’s entire skill tree allows you to plan a route through them, should you so wish. We don’t have any new videos, actually. This distribution of perk points is a delight in itself, thanks to each skill tree being represented by a constellation of stars with exquisite colouring defining the three primary areas of development: magic, weapons and armour, and non-combat skills such as lock-picking and speech. 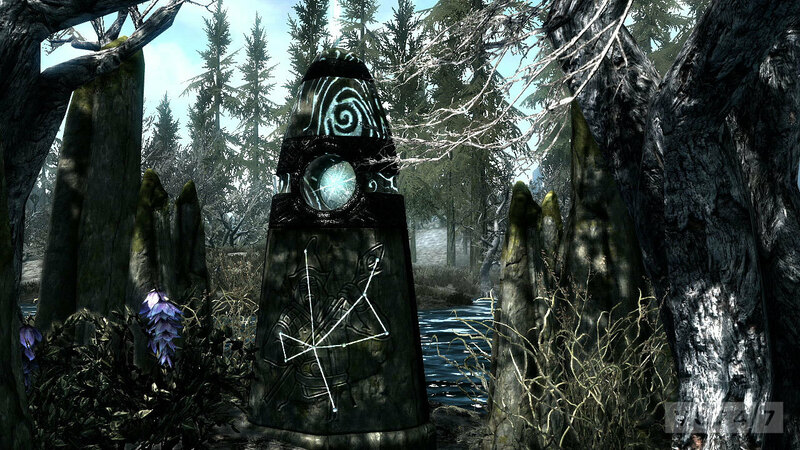 This may seem like a lot of fuss about a user interface but you’ll be spending a not-insignificant amount of time dipping in and out of it over the 30-odd hours of the mains quest line and the scores of hours spent exploring Skyrim – so, it’s important that it doesn’t induce headaches or terminal boredom. I mistake a slight pause when opening the menu as a pre-Beta build glitch, but Carafano explains that’s the game auto-saving – how often is does this when you open the menu is controlled by you via the settings options. One or two minor bugs do surface, however: a well placed arrow that fells a man soon to be hung for high treason also causes his royal guard minders to collapse next to him and in the ensuing panic, the game freezes up entirely. 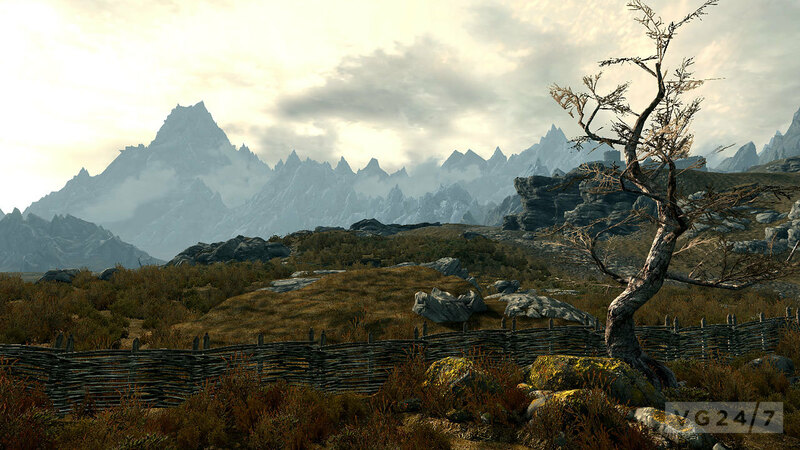 Being pre-Beta these hiccups are likely already fixed in the latest version, but the quality assurance team have their work cut out to ensure a world as large as Skyrim’s ships as bug-free as possible. 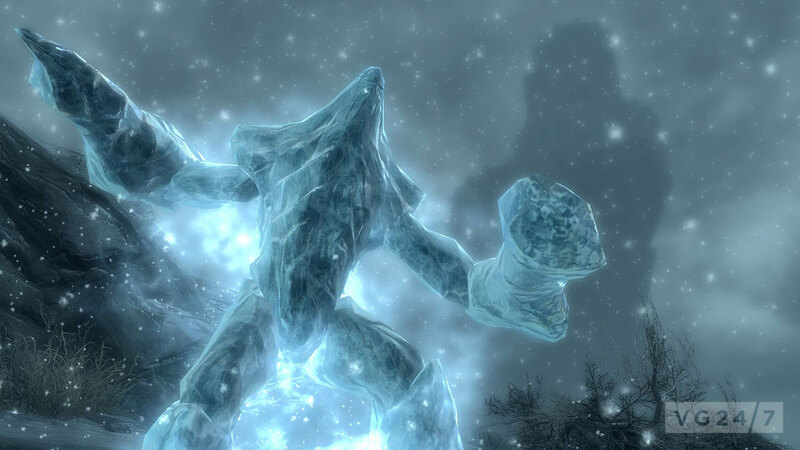 Back in the game, I’ve move away from the broken bodies of the bandits, to take shelter from the swirling mountain winds by descending into Bleak Falls Barrow, where my first quest begins. What follows is a tale of wandering Draugrs, a giant arachnid, traps, capture, rescue and betrayal, in search of the golden claw and its secrets. Maybe one will arrive today. Bleak Falls Barrow is a dungeon immediately more memorable than any from Oblivion: vegetation fighting to gain a hold amongst the cold rock, low tunnels giving way to exposed chambers through which the bleak sky can be glimpsed and a narrow bridge hewn from the rock spanning an abyss into which an underground waterfall cascades. All of this has been deliberately placed by the level designers and artists to ensure that descending into a dungeon isn’t a joyless slog. I emerge, victorious, into the pink-tinged light of early dawn, the proud custodian of one of the game’s 20 Shouts: a magic ability that is not tied to your magic stats, meaning even the most heavy-weapons focused of characters will benefit from them. And to do that, I need to slay a dragon. But that is a tale for another day. 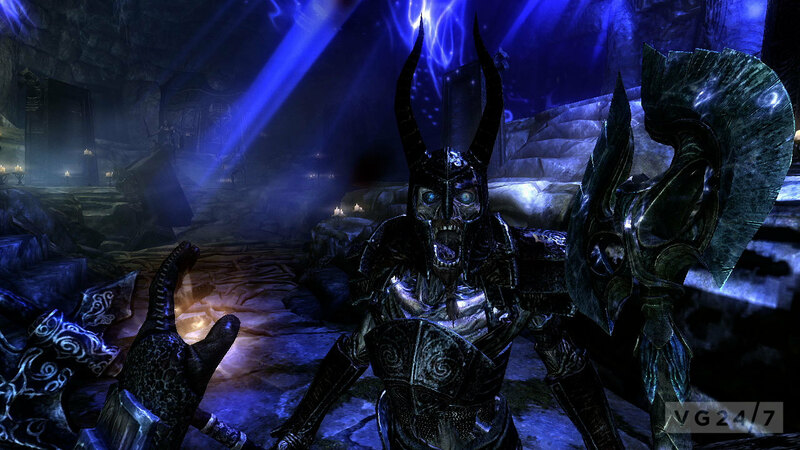 The Elder Scrolls V: Skyrim launches worldwide on November 11 for PC, 360 and PS3.